The wife of a respected Richmond police officer who was killed when he intervened in a domestic dispute involving family members is reflecting on the past year. RICHMOND, Calif. (KGO) -- The wife of a respected Richmond police officer killed while off duty is reflecting on the past year. It was a year ago this weekend that Ofc. Gus Vegas was killed as he intervened in a domestic dispute involving his daughter and grandson's father inside his Vallejo home. Sandra Vegas says it took several moves to finally find a home that felt right. "And we needed a quiet place because the story was so loud," she said. It was just after 430 a.m. a year ago when Sandra's husband intervened in the domestic dispute that cost him his life. "It wasn't just your average murder. There was so much to it because of where it happened and who it was," she said. Sandra says she considered Robert Vega her son. She says she forgave him immediately afterwards. His trial is scheduled for May. Sandra says she has seen him in court and spoken to him on the phone. "He told me he loved me and that he loved pops," she said. "I just told him: 'I forgive you, I love you,"' she said. 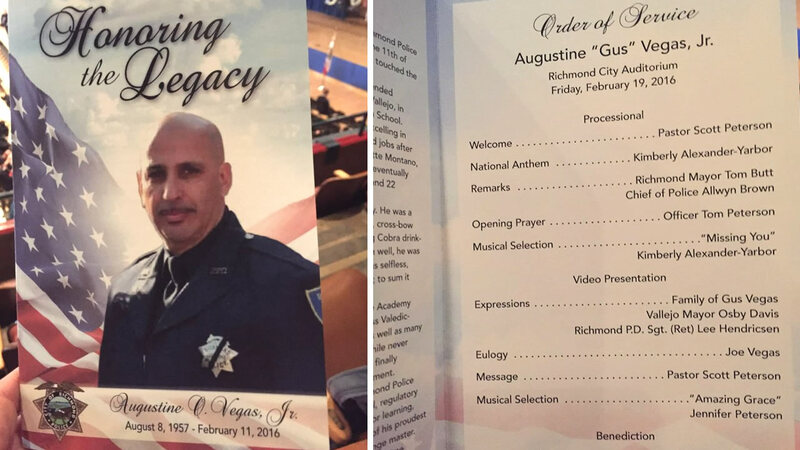 Gus was a 15-year veteran of the Richmond Police Department. He worked as a patrol officer and detective in several units, including homicide. At home, he was a family man, a father to 10 children and twice as many grandchildren. "It has changed all of our lives so much," Sandra said. She says it's hardest on his daughters who were in the house when he died. "We said we were never going to try to figure it out, there was no answer," Sandra said. She credits the City of Vallejo, Richmond Police Department, her family and especially her faith for holding her up then and now. A public memorial will be held today for Richmond Police Officer Gus Vegas. The 15-year veteran was shot and killed inside his home last week. Click here for full coverage on Richmond Officer Gus Vegas.